573 girls and boys attend this school. 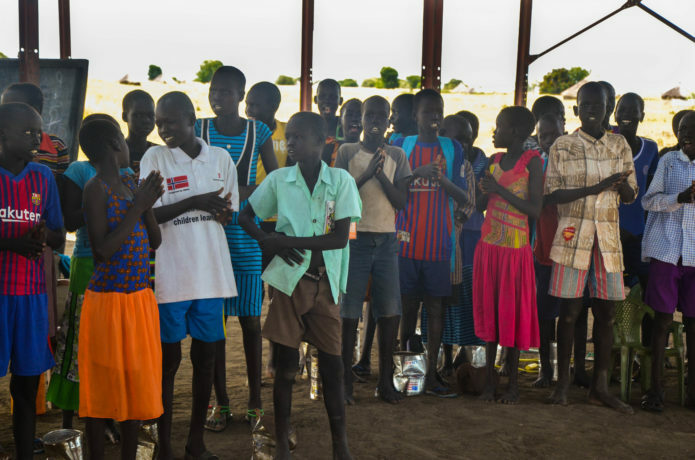 Building a school is Rebuild South Sudan’s inaugural project. The idea for this school came from the Jalle community in 2007. Planning began in 2009. Construction began in 2012. Classes began in 2013. Roof installation was in 2015. 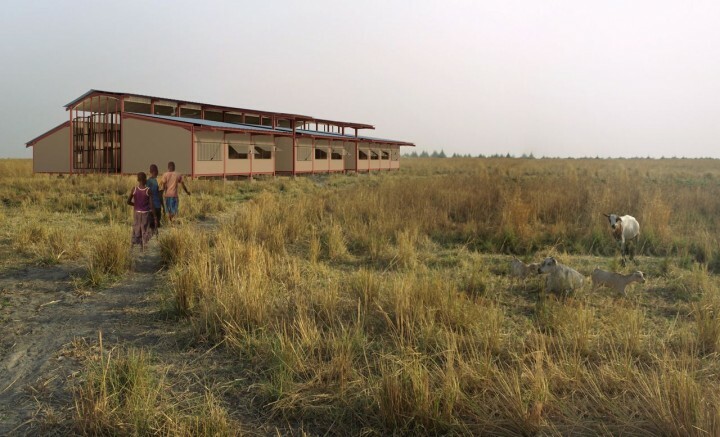 Now, even as school is in session, we’re working towards walls, floors, furniture, solar panels, and eventually a computer lab. We are also happy to announce that part of the building is designated for clinic space. Currently it takes a few hours to walk to the nearest clinic. a campaign to finish the construction of the school. We need $160,616 in total! This includes installing walls, floors, and repairing the roof where there is wind damage. We know that we need 16,000 bricks to make this school a reality. That is $10 per brick. For a people displaced by war, a permanent structure represents more than just shelter; it is a statement of belonging once again to their homeland and hope for the future. We aim to build a safe and permanent structure that doesn’t need to be rebuilt each year when the land floods. We have designed a school to exceed the standards of UNICEF’s Child Friendly schools. We were invited by and have worked with the community from the start to build a school that will best meet their needs. The school will also serve as a community center by creating a large space for gathering, providing a clinic, along with public access to books and computers. 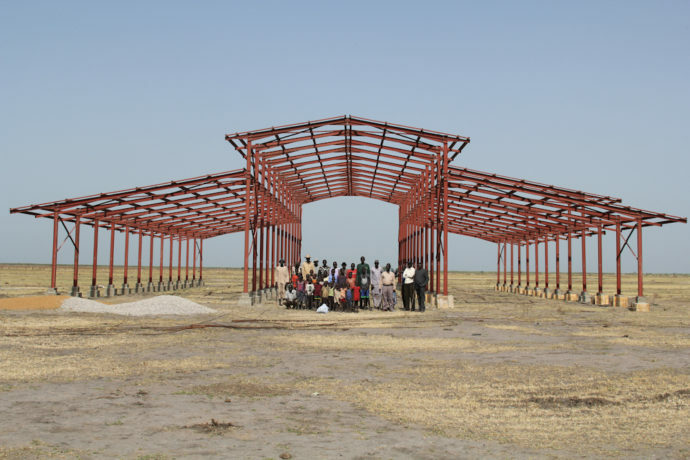 Building in South Sudan is one of the most expensive countries in Africa in which to build due to the lack of supplies and infrastructure. We are utilizing appropriate technology, relying on local labor and leadership, and tightly managing our budget to make sure our school is competitive with any other similar school project. A building in this climate can easily and unintentionally become uninhabitable – hotter, darker, and more humid than outside under a tree! Our deceptively simple design has been born from extensive fluid mechanics modeling, careful attention paid to building orientation, proper shading, prevailing winds, and window size and placement used to create the most comfortable and practical learning environment possible. The building will be the only permanent structure within 7 miles, and likely the only flood-resistant building in the region. It will serve as a community hub as well as a safe place for learning. Eight large, well lit and ventilated classrooms will accommodate up to 640 students in two sessions. Flexible furniture and solar lighting will also allow the space to be used for adult education in the evenings. A 6m x 36m (3100 square feet) hall will be used as a community hall. The library can house 5000 volumes available to both students and community members. A computer center, located at the school entrance, will connect Jalle to the rest of the world and, perhaps equally important, function as an incentive for students to come to school regularly. Part of the building will be used for a clinic providing health care for the Jalle community. Total estimated cost of building the Jalle School: $315,009.